The 20 x 40 Victoran pole tent package includes (8) 5' round tables and (64) black chairs. The package price includes installation. We recommend the 60" round for seating but banquet tables can be also be used. Please call our office for more details. 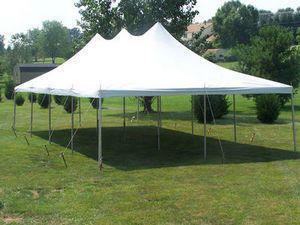 The 20 x 30 pole tent must be installed on grass and requires a 28' x 48' area for installation.